On a big sales event like Amazon Prime Day, we always have a hot wish list of items that we hope will get some big discounts and we bet you do too. And if you've been waiting to get involved with the world of smart speakers, we imagine the Google Home Mini has caught your eye. Of course, Amazon will be hoping hope to sell huge numbers of Amazon Echo and Amazon Echo Dot speakers on Prime Day - and they probably will. We're well used to seeing Amazon discount multiple Echo smart devices on days like Prime Day, Black Friday and just for the hell of it at multiple times during the year. 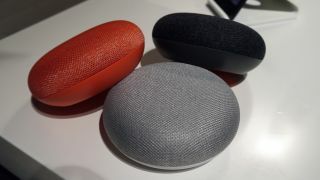 And whenever Amazon lowers the price, Google quickly follows suit with similar discounts on the Google Home and Google Home Mini speakers sold on its own store and at popular electronics outlets like Walmart or Newegg in the US and Currys, Argos and AO in the UK. Whatever price Amazon Prime Day unveils for the Echo Dot, you can be sure the Google Home Mini will match it at all the big retailers. Well, everyone except for Amazon who don't actually stock any Google Home products thanks to a spat the two companies are having over YouTube on Amazon's screen-enabled Echo devices. So what prices are we expecting to see? Well in regular sales, we're used to seeing the Amazon Echo Dot deals and Google Home Mini prices drop to around £34.99 ($39.99 in the US) down from the original £49.99 ($49.99) - although both speakers seem to be settling around £39.99 in the UK at least nowadays. However, expect an even better deal on Prime Day. We suspect the Echo Dot will drop to at least $29.99 (same as the Black Friday price) and the UK price to potentially beat the frequent £34.99 sale price, possibly £29.99. The Echo Dot is by far and away the best selling smart-speaker in the world - it was first to market and has been aggressively advertised ever since. The Google Home Mini was late to the party, but arguably has the better product thanks to the smarter Google Assistant (sorry, Alexa), better compatibility with your Google accounts and android mobiles and the ability to use the free version of Spotify on it (paid version only on the Echo speakers). What's more, Google has really stepped up its advertising campaigns recently. And we've generally found there's no room for two different brands of smart speaker in a home, so it's certainly time to pick a side. With both Amazon and Google potentially hacking into their profit margins with such big discounts though, it opens the way for some bonus add-ons to tempt a purchase over the rival smart speaker. We've seen the Google Chromecast occasionally come bundled with some credit for the Play Store, so keep an eye out for something similar with the Home speakers. This is all fantastic news for buyers as no company wants to lose ground to the other on key discount periods so they'll be keen to offer the better deals. Amazon Prime Day may be all about Amazon's deals overall, but the giant retailer is all set to potentially provide an ample opportunity for Google's Home speakers to catch up via price matching at other retailers. Whatever happens though you'll be able to get a fantastic price on either smart speaker and we'll be bringing you all of the best deals from any retailer in our Amazon Prime Day coverage hub.